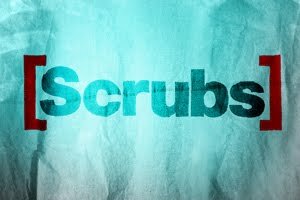 After being dropped by NBC and picked up by ABC, Scrubs returns to network television tonight at 9/8c with back-to-back new half-hour episodes. Zach Braff reprises his role as Dr. John Dorian (albeit for only six episodes), where he, Turk (Donald Faison) and Dr. Cox (John McGinley) are teaching a new batch of med students. This new premise takes place in the classroom as well as the hospital, and features many other familiar faces — Ken Jenkins as Dr. Kelso, Robert Maschio as The Todd, Eliza Coupe as Dr. Denise Mahoney and Sarah Chalke as Dr. Elliot Reed (for six episodes). Taking over the role of narrator from Braff's Dr. Dorian is new med student Lucy Bennett, played by Kerry Bishé. Other featured characters are Cole Aaronson (played by Dave Franco, who is also James Franco's brother) and Drew Suffin (played by Michael Mosley). I have already seen the first two episodes of the new Scrubs, and as a fan of the old series, I can say that the new series is already finding its groove — with the help of Zach, John and Donald. Hopefully the show will still hold up when Zach takes his final bow. Judging by what I've seen so far, I'd say the chances are very good it will be able to hold its own.